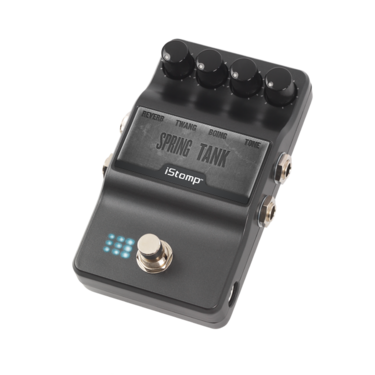 The Spring Tank Reverb pedal faithfully recreates a sought after effect that has been integrated in classic combo amps for decades. 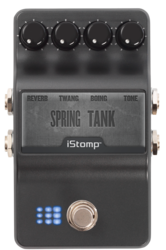 All the tone and reaction of a mechanical spring reverb is finally captured in an easy to use stompbox with more control than has ever been available. 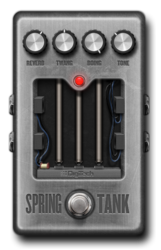 Reverb, Twang, Boing and Tone knobs let you tweak in the reverb exactly the way you want it. Crank it up for your favorite surf songs or dial it down for a touch of warm ambiance. REVERB - Controls the output level of the reverb effect. TWANG - Controls the resonance of the reverb effect. 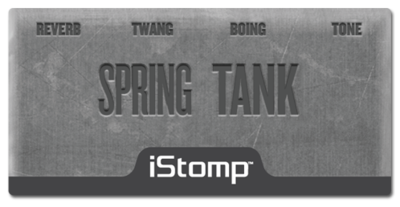 BOING - Controls the amount of spring flutter. TONE - Controls the high frequency response of the reverb.